Psychologist Carl Jung created a list of 12 archetypes that he based on the observation of differing and repeating patters of thought and action that reappeared across time and place (expands different locations). The word archetype has its origins in Greek. "Arche" means "Original or beginning" and "typos" which means "mold or pattern." 1. Choose an archetype from the list above. 2. Find an example of that archetype in literature, film, tv shows, anime etc. 3. Find descriptive words that capture the character and how he/she fits the archetypal role. 4. 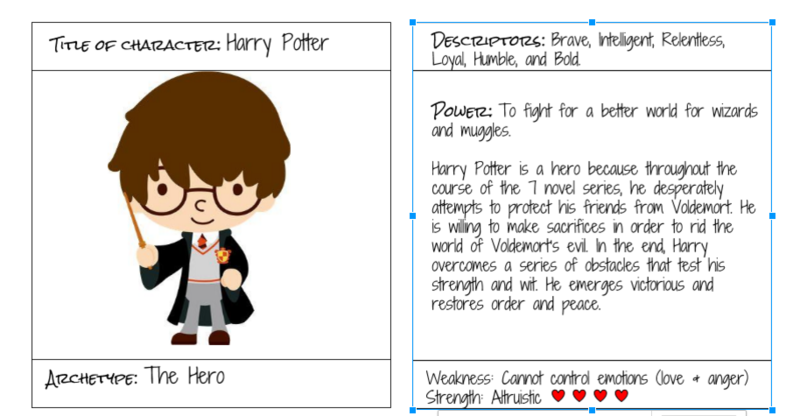 Identify weaknesses and strengths of the character. 5. Provide reasoning for why this character fits the criteria for this pattern.